Home from Work. Arthur Hughes (1832-1915). c.1870. Oil on canvas, H 75 x W 106.5 cm. Collection: Russell-Cotes Art Gallery & Museum, accession number: BORGM 01112. Purchased from George Knight, 1932. Kindly made available by the Gallery on the Creative Commons Attribution-NonCommercial-NoDerivatives licence. Image acquisition (via the Art UK website), commentary and formatting by Jacqueline Banerjee. Here is another of Hughes's "engagingly fresh landscapes" (Wildman), again with nearly every element that the Times obituary found in his most appealing work: "No artist ever painted spring meadows, country children, and frisking lambs, with more evident delight." However, the lambs are replaced here by a milk-white calf, while the blossom and cowslips, the latter mostly picked and strewn carelessly on the grass, give an extra fillip to the scene. The way the child reaches out to her weary-looking father, as he returns from his wood-gathering with her older brother, is especially touching. So too is her elder sister's affectionate watchfulness. The general sense of harmony between domestic and natural life, of everything thriving together, is very cheering. Such an atmosphere is an added element that no amount of training can help a painter capture. It is no surprise to learn from Stephen Wildman that Hughes was a genial soul — modest, good-natured and "universally liked." This work is a partner to Hughes's The Woodman's Daughter. Both had been commissioned by James Leathart, the art collector in Gateshead (see Newall 33), and are widely seen as genre paintings, because of the popularity of woodland backdrops both in early photography and Pre-Raphaelite art. Millais's The Woodman's Daughter comes to mind, although that was inspired by Coventry Patmore's sad poem of the same title, about a girl who was eventually seduced by the squire's son — with dire consequences. But Hughes's two paintings are focussed on a smaller child in this woodsman's family, and she is not charged with any ominous or negative associations. Quite the contrary. "Mr. A. Hughes" (obituary). Times, 23 December 1915: 6. The Times Digital Archive. Web. 28 March 2019. Newall, Christopher. The Pre-Raphaelites: Beauty and Rebellion. Liverpool: Liverpool University Press, 2016. Riggs, Terry. 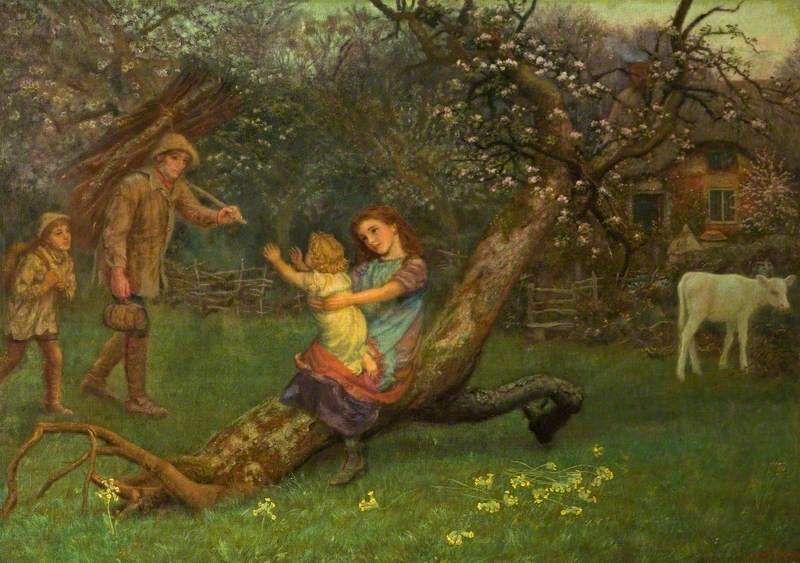 "Arthur Hughes: The Woodman's Child" (Gallery summary). Tate. Web. 28 March 2019. Wildman, Stephen. "Hughes, Arthur (1832–1915), painter." Oxford Dictionary of National Biography. Online ed. Web. 28 March 2019.